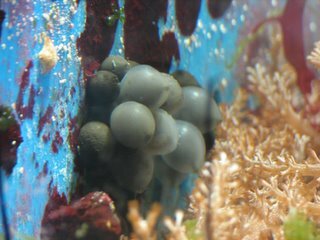 For the past several months I have been captive rearing the babies from wc S. bandensis eggs and selling the eggs through www.NewAlameda.com . This has worked out very well for me because they take care of the ordering and the shipping. Several people from TONMO.com have bought babies and are doing a great job of posting their progress. 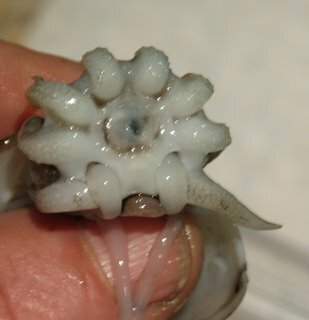 Sadly, it looks like I am out of cuttles for sale. I have about 10 cuttles that I plan to keep for myself, and yesterday they moved onto larger shrimp and off of pods. None of the eggs made it, and all the adults are gone. Hopefully, I will soon have the energy and enthusiasm to start again. As you can see, the eggs aren't doing well at all. Sadly, none of the other laid have been fertile either. I have no idea whats going on. Here is the egg update. They aren't doing as well as I would like and I am not sure what the cloudy stuff is around some of them. Good news is they cuttles are still mating! I also took this pic of pockets in which the feeding tentacles emerge from. I thought it was interesting. I walked into the cuttle room just now and floating mid water, against some macro algae was a dead cuttlefish. No signs of fighting, both tentacles in tact. Mystery death? Stress? Female after laying too many eggs? Not sure. I will attempt a dissection tonight. The dissection shows nidamental glands, so female. Maybe death after eggs, maybe moving her eggs upset her (although I don't know for sure if its the mother of the first eggs, but there is only one cuttle in that area now). 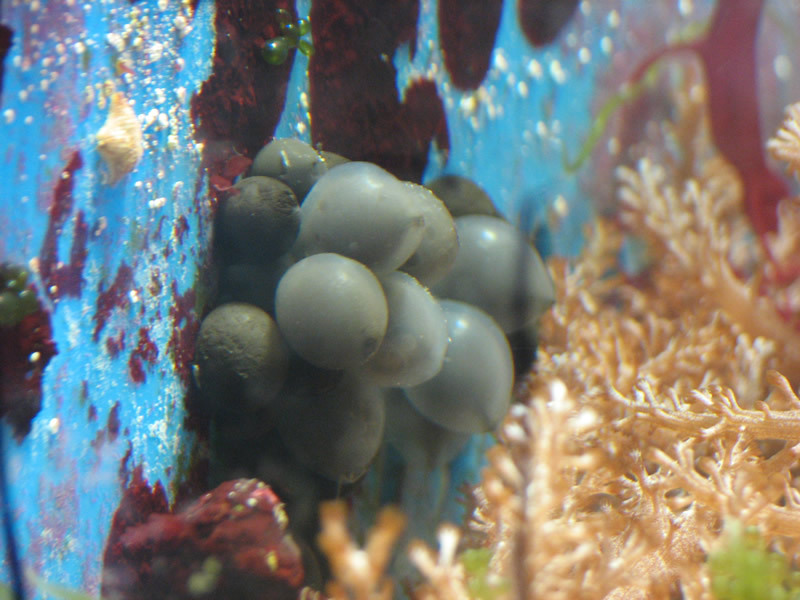 And, here is a pic of the photographable eggs, day 3. Finally, a bunch of eggs that I can photograph! These were laid on the "open" divider in the 100 gallon tank by a different pair than laid the last clutches. I will try to take pics of them daily to chart their progress. One of the pair that hangs around these eggs was jetting water onto the clutch and feeling the eggs with its arms. 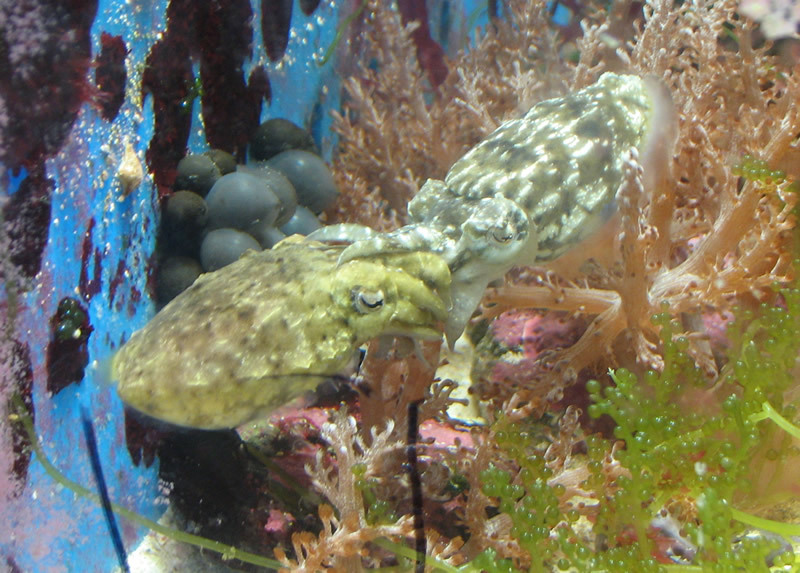 On the other side of the tank, the smallest cuttlefish in the group of 10 was mating a female. Several of the larger males tried to move in, but the little guy fought them off. I couldn't collect crabs for the past few days because the low tide was in the middle of the night. I woke up to find the cuttlebone and flesh pictured. 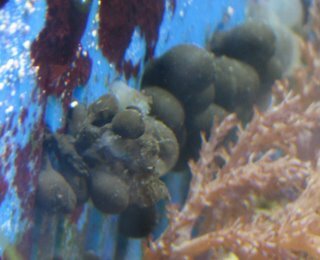 Cannibalism is alive and well in underfed bandensis groups! I think it looks like a surfboard that a shark has taken a bit from.